Researching what is “the best transcription software” can be a little overwhelming. There are a lot of different answers. A lot of companies promote a “free” software, but free in a very limited capacity. Also speech to text software comes up in search results, like Dragon Naturally Speaking, but that isn’t a transcription software. That’s a dictation software. We covered the differences between dictation and transcription software in this article. As an experienced transcriber I’ve compiled a short list of the best transcription & audio dictation software available today. You can customize your time code & there is an automated time stamps feature. Software can convert audio or video types to other formats automatically. You can type in an MS Word document as you playback your audio or video file. Terrific customer service. You will get a response from a human within 24 hours. Affordable – $0.93 per month or $22.32 for a 24 month license. Due to the positive response from this blog article, FTW has kindly offered our readers a discount code. Click here to receive your code “flawless” during checkout. Free to try & very affordable to buy at $34.99. Intuitive and easy to use. Great for beginners and experienced transcribers. Imports almost any audio or video file. Available on Mac or PC. Difficult to customize your time stamps. Doesn’t have as many features as other programs. 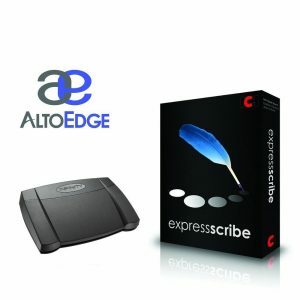 Currently you can buy Express Scribe bundled with a USB foot pedal. This bundles contains both a foot pedal and USB Spectra Headset. Works with almost all audio & video formats. Includes a USB foot pedal. You can customize your time code setting. You can type in MS Word as you playback your audio or video file. This is an upgraded version of the Start-Stop Universal Transcription System. The features, advantage, and disadvantages are the same as the standard software. Includes a Free Spectra PC Headset as well as the USB Foot Pedal. Plays virtually every audio and video format on any Windows PC. Works with all audio & video formats. Can set a custom time code. Price is $99 per license. You are required to type into their text editor. I’d prefer typing directly in MS Word. InqScribe requires the user to export and convert the transcript before you can edit in MS Word. Best audio to text dictation software on the market. Fully customizable to suit your needs. The speech to text technology works very well. Works in any application where you would normally type. You can use this software to assist you in typing. Not a transcription software. It is a dictation software. Only accurate with one speaker at a time. Newer versions seem to be PC only without a Mac option. The WordSlinger Deluxe is specifically designed for audio transcription & spoken word. This focus on spoken word is achieved by the frequency response that’s built into the headset. Also, these headphones have built-in audio and volume controls. It comes with a 10 foot cord & plugs directly into a USB slot. It’s a great headset and retails for $59.95. A foot pedal for me is a big time saver. The reason you want a foot pedal is you can rewind, fast forward, and play the video with your foot. This means you don’t have to use your hands, the mouse, to control the video. I do not want to stop typing and grab my mouse and hit the rewind button, or even use a keyboard shortcut, as I don’t want to get my hands out of position while typing. Using a mouse to control the video will slow you down significantly. I use a USB foot pedal by Infinity, it works with every transcription software I use and every computer, both Mac and PC, I have. 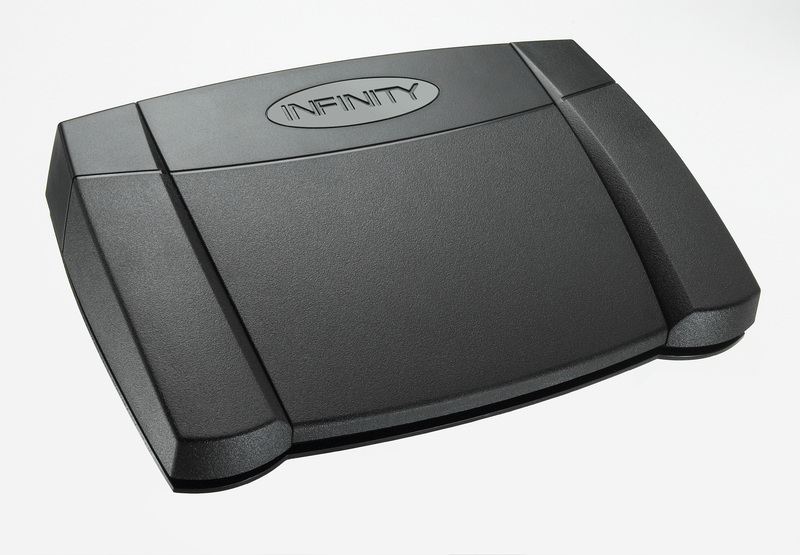 The Infinity USB foot pedal responsive, versatile, and well-priced. I’ve been using these for years and have never had any issues. I hope this article was helpful. Comment below if you have a favorite audio transcription software and please leave any questions or comments you might have. If you have audio or video files that need to be transcribed please feel to request a quote or visit our transcription page. Happy transcribing! Click here to see our reviews of the best headphones for transcription. Hi, I am just starting out a home business for legal assitance work and have looked at both Start-Stop Universal Transcription on Amazon and ExpressSribe. Both have great reviews and both come in packages with pedals and headphones. Can you tell me which you prefer and why? Your is the best reviews of the products I have found so far. Thanks Sarah! Express Scribe is the best software for someone who is starting out, it’s very user-friendly and runs well on every computer. Start-Stop is better for someone who is transcribing video with time code. Good luck with your home business! Thank you for your reviews. I have a question: Do you know if there is any way to transcribe *with a foot pedal* that does rewind and fast forward, with WIndows Media Player? (I use it for better sound clarity when Express Scribe does not work, but it’s not very useful without a foot pedal). Hello, thanks for visiting our site. Unfortunately Windows Media Player does not have foot pedal functionality. You could try downloading FTW Transcriber, it’s free to try and you could see if the audio quality is any better. vPedal works with Windows Media Player. The pedal was $75, and the plug-in for Windows Media Player is free on their site. I’ve been using about 10hrs a week for the last year. For poor audio, I recommend a utility called VLC – (VideoLAN.org) and you can use universal hot keys. It’s a free download. I use this to proof my Express Scribe transcripts. ExpressScribe actually does have a functionality for setting timecode to start at unique times, but it’s a bit buried and unintuitive. If you right click on the file and select “Dictation Information” there is a line that says Time Offset, and you can actually enter any time code you’d like there. Oddly, this is one of the only fields in that menu you can alter, the rest are just information but that one you can alter. It’s a lifesaver. You do also have to make sure in your display options that you’re displaying elapsed time and not remaining. Hello. I am curious if you have tried a transcription package called GearPlayer and your thoughts on it. To me, it seems very intuitive and has all the features you would be looking for in a transcription package except that it doesn’t work on a Mac. Thanks. I actually used GearPlayer a long time ago on a Windows XP machine, I haven’t used it in years, but it was a very good and reliable software. I think it’s definitely worth trying out. Thanks for the great reviews. I’ve been using Start-Stop for 20 years, and it’s always been good to me. 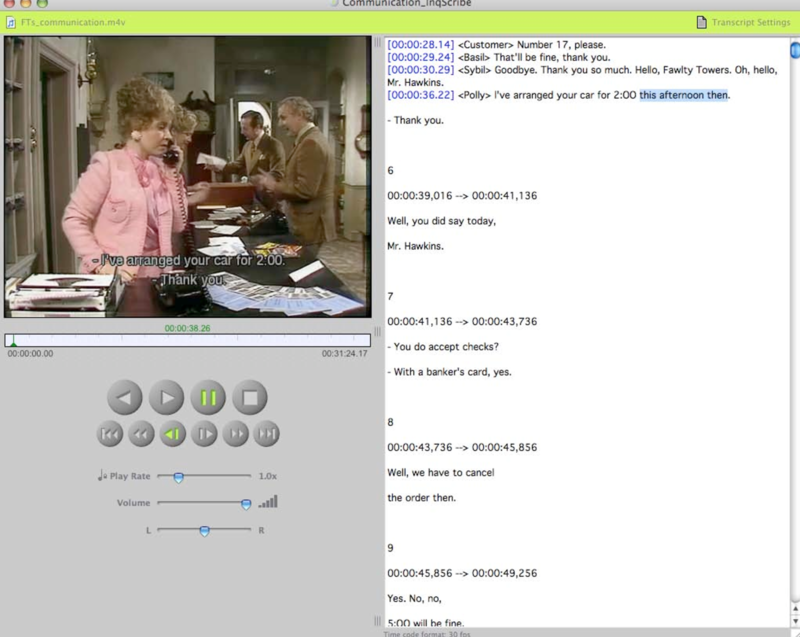 However, I’m typing more and more closed captioning, and ran into a problem. The video was shot with a different number of frames per second than the Start-Stop default, and there is no way to change it. 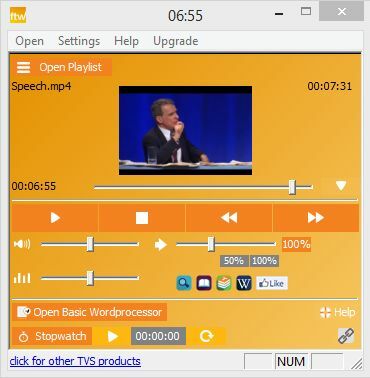 Do you know of any professional closed captioning transcription software that has more features? Yes I do. MacCaption by Telestream is a very good captioning program and you can set the FPS to match the video, however it is rather expensive and takes some time to learn. I am planning on working to transcribe a series of webinar videos into text. What software would you recommend? I’d personally go with Express Scribe. It’s very user-friendly, loads video very well, and works with every computer I’ve tested. Hi I’m a freelance journalist trying out transcription as an additional income source. While I see several people recommend Express Scribe, there are also some negative reviews online about this software. People say it is not that user friendly, opens your computer up to viruses and is almost impossible to get rid of once installed. Help! I don’t want any of this to happen, but really want advice on a good, reliable and free software to use! Your expertise would be greatly appreciated. Thanks for the question. In the past, when I first started using Express Scribe, it definitely had some issues. Express Scribe would try to install additional software, their licensing/upgrading process was intentionally confusing so you’d end up having to spend extra money. However, that doesn’t happen anymore. I think a lot of people were turned off by those two issues. – Regarding User Friendliness — Express Scribe is very easy to use. You simply click and drag audio/video files into Express Scribe’s player and the files are ready to transcribe. – Regarding viruses or spyware — I’m not aware of that happening. I’ve been using Express Scribe for around 8 years and I’ve never had that issue. It’s always a good idea to have real-time virus protection on your PC at all times. Macs generally do not get viruses from software, so it would be safe on a Mac. – I can’t recall every uninstalling the software, so I’m not sure how easy it is to uninstall, but my guess is you go into uninstall programs in Windows and go through the normal process. Another alternative is FTW (http://www.theftwtranscriber.com/upgrade/?code=flawless). Very cheap, works well, & user friendly. I use this software as well as Express Scribe and Start/Stop. Hope that helps! Good luck with everything. Thank you for the great article! You mentioned in response to another comment above that you use FTW, Express Scribe and Start/Stop. I’m only transcribing video files with time stamps. I’ve been using a vPedal to control play back in Windows Media Player and typing my document in Word. I’m mainly looking for a software that can make time stamping easier then just typing it in as I go, and watching to make sure I get one every 30 seconds, and one that can help control play back speed when needed on a difficult file. Out of the three you use which do you think would help me most? Thank you again for sharing your knowledge and experience. Also, I agree with you on the Bose noise cancelling headphones. I love mine for transcribing. I only wish I had paid for wireless ones as that would have been worth the $. Thanks for reaching out & enjoying the article! I think FTW Transcriber is your best choice for transcribing video files with time stamps. I believe there’s even a feature to do auto time stamps as you type. But even manually printing them is very easy, you just make a keyboard shortcut. 2, Is there a program for transcription of Spanish? I believe that inqScribe can work for Spanish, but does it convert as in 1. above? To answer #1, the only software that might work for speech recognition is Dragon. But you would have to speak into the microphone and dictate the words. And to answer #2, any transcription software — including Inqscribe — can handle a Spanish audio file but you would have to manually type each word. Hope that helps. Thank you! Thank you for your response. I am still unclear: If Dragon can turn my dictation into text, why can it not do it when the sound source is a recording? I’ve used Dragon in the past, it learns your voice over time. You speak directly into the microphone. You have to vocalize special commands and other things to have it work properly. If the software has changed and it allows you to input digital audio files then that’s great, but to my knowledge Dragon isn’t able to do that. I hope that helps. Ricardo, Dragon Professional Individual 15 will do exactly what you’re asking about. It will convert any .wav file (I think it works with .mp3 also) into text, and it’s surprisingly accurate! Thanks for the question. I don’t have personal experience recording a meeting. I do think switching to digital would make your life a lot easier. I would suggest (as you mentioned) getting a couple of digital recorders and a few microphones. 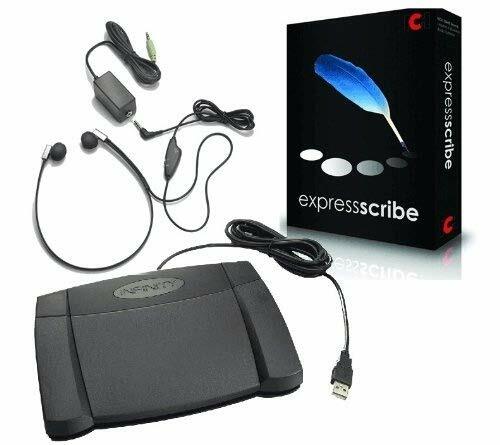 Once you have the recorded MP3s I think Express Scribe or FTW would suit your transcription needs and those programs are much cheaper than Start Stop. I am using Express Scribe and would like to know how to transfer dictation from one source to my express scribe. For example I type for a library, they record on a USB, I go and collect it and then put it into Express Scribe. How can the library export the recording into my express scribe to save me the journey? Thanks for posting the question. It sounds like you don’t want to physically pick up the USB stick, that’s understandable. Sending digital audio files is pretty easy. The library could sign up for a free service like Dropbox or Google Drive and send you the files that way. Once the library uploads the file to a service — like Dropbox or Google Drive — you would get an email notification and then download the audio files from there. Unfortunately you’ll need to download the video before you can transcribe it in InqScribe. If it’s from YouTube there are some programs out there that will let you download the video. I’m not aware of any transcription software that will let you load a file directly from an online link. THANKS so much for your response! I got it sorted but InqScribe actually doesn’t do the typing. I’ve since tried Trint but the video keeps failing to load and I’ve not heard back from their help department. Do you have a recommendation from another software that shouldn’t have any hiccups? I am a scopist (transcribing court reporters’ MP3 and WAV files). I have been using Transcription Buddy for years, but it seems now not to work well with the files – it skips words often. I use an Infinity foot pedal with it. With that software, I am able to have one pedal for rewind, a pedal play at normal speed, and a pedal play at variable speed (whatever I set for that job). Do any of your recommended software packages allow for that? I know Express Scribe does not have the variable speed assigned to a foot pedal. If you have a Windows PC computer then I would give FTW a try. It’s the software at the top of the article. FTW allows you to adjust the playback speed of any audio or video file. You can go from 20% to 250% speed. If you have questions before purchasing FTW you can always email their support, they’re very helpful. Additionally, we do have a discount code for the software in the article as well. Hi there! Is there any tips or recommendations that you would give to someone who is just starting out, and really wants to get into transcription, but doesn’t have any experience. If you type well and fast then you might want to try transcribing some audio at home and see how you like it. You could buy some transcription equipment: a foot pedal, transcription software, and headphones. For other advice there’s a handy Facebook group called Transcriptionists Helping Each Other Out. It’s private, but anyone can request to join that group. You can also do some Google searches for transcription resources and jobs. Reddit is a good resource as well, there’s transcription groups on there. Do you know of a software that allows a typist to type transcripts in software similar to a court reporter software? In other words, a software that can be imported into a program such as YesLaw or Reallegal eTrans. We currently use YesLaw and can make a Word doc work in it but not without a lot of tweaking. That’s a good question. I don’t have experience with court reporting. To my knowledge, the software listed & reviewed in this article cannot directly integrate with a court reporting program. For example, with FTW Transcriber or Express Scribe you load up the application first and then work in whatever your preferred text editor is. You could try asking this question on Reddit, more than likely there’s a Court Reporter group on there who might be able to steer you in a better direction. I have to transcribe meetings with several board members, thus several voices. Is there any software you can suggest that could transcribe this for me? I appreciate I will have to listen and ‘proof’ read this at a later stage. Thanks for the question. To my knowledge there is not a software out there that can transcribe this for you. The voice recognition technology is not there yet. Keep searching and good luck! I need your help. I have a 2hrs long audio and video files that I want to transcribe automatically. It is a zoom call recording for webinars, would be easier for students to search a specific item if it is transcribed or tagged. Which software is best for these needs. Thanks for your question. To my knowledge there is no software that can automatically transcribe for you. You’ll have to pay a service or hire a transcriber to type this for you.